Aaarrr! Now this is me type of app. Har, har, har! Aye, Slayin tis’ called and I be slashing me blade everywhere, killin’ monsters and whate’er else this bucko comes across. Me and my fellow pirates love playing this game when we’re not treasure hunting. You will love this app too. And I declared that in the name of good, ol’ Calypso. This app was developed by FDG Entertainment for iOS users. It can be downloaded from the App Store for $0.99. This is an endless game that will keep you playing as long as you want. Learn more about it with this Slayin review. 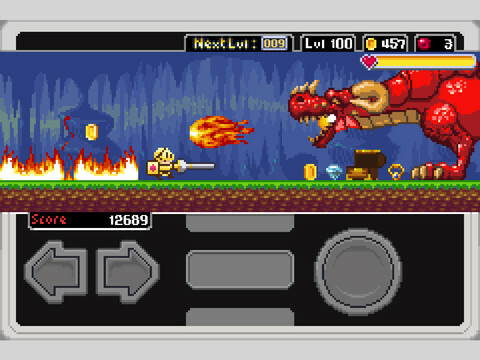 The game is a combination of role playing (RPG), endless runner and arcade game, which is something that you would not usually see in one application. There are three characters to choose from including knight, knave and wizard. The main goal is to slay your enemies and survive as long as you can on the game. While this is an endless RPG game, there are various quests that you need to complete on each game level. This will make you level up and get higher points for bragging rights. There are also boss fights per level. The controls are pretty basic. Tapping the left and right arrow at the bottom left of the screen will move your hero to the desired direction. The big round button on the lower right of the game window will make it jump. You may need to do this every now and then to prevent getting in contact with the enemies, especially the bosses, as this will decrease your health and eventually lead to your death. You don’t have to worry about the attack, as the hero does this automatically. The most powerful boss in the app is the giant dragon, which you will only face if you were able to succeed on various difficult levels of the game. If you character dies, the game will start from the beginning, which is both frustrating and challenging. Since this is an endless game, it offers unlimited hours of gaming adventure. The graphics of the game may not wow you like the 3D graphics of most apps today; however, its simplicity is still appealing because it brings you back to the classic arcade game feel. The background music and sound also do the same. The pacing of the game is just right as the first few levels are easy to finish, allowing you to become more familiar with the app. The levels then become more difficult as you progress, making it more challenging. 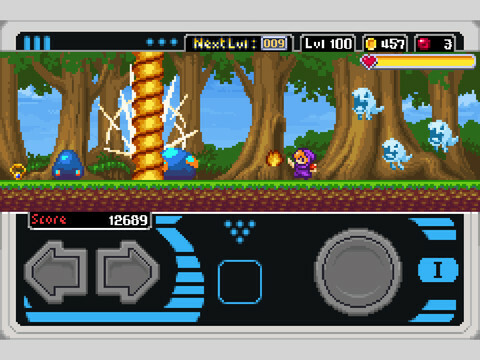 As you move on in the game you get hooked to the pixelish graphics and music, making you craving for more and more. While leveling up gives you bragging rights, it would be much better if you get extra coins or fame currency that you can use for your upgrades. Furthermore, the game pauses for a short period when your hero levels up, which can sometimes be annoying as it affects the momentum of the game. For $0.99, you will get your money’s worth for downloading this game. It will give you endless adventure fun. The arcade-like graphics and sounds add pleasure to the game. It has various objectives that you need to complete preventing the game from being monotonous. Slayin is a great game, this dusty old Pirate definitely advocate!